Joe Scarborough from his site, a pic for the press. Must have found a puddle for his flaming britches. Time and time again, throughout the present debt extension debacle, rational and historically informed people including the writers featured in Gulag Bound have explained how even a government shutdown would not mean a debt payment default by the United States federal government. Throughout this time, U.S. Rep. Michelle Bachmann has lead the way. But truth and reality did not keep Joe Scarborough from going hard, raving propagandist on Bachmann’s answer to a debt extension question during the Thursday, 8/11 GOP debate in Ames, Iowa. 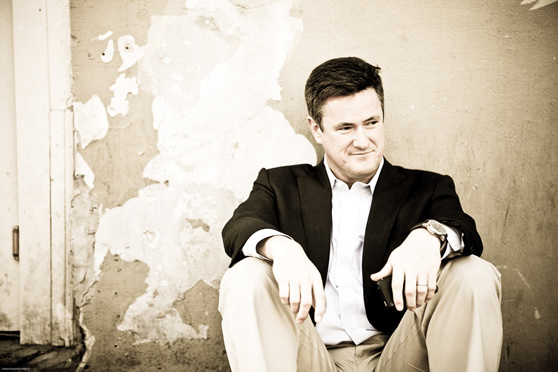 Scarborough, lowering himself to the levels of O’Donnell, Maddow, Matthews, Shultz, Ratigan, and Bashir, showed in spades the following morning, why he works for MSNBC. JOE SCARBOROUGH: Michele Bachmann’s first answer, Mark Halperin, was “I wish the federal government had defaulted.” Had defaulted, a week after Americans had lost–some of them perhaps lost half of their pensions. Lost half of their 401(k)s, when trillions of dollars went down the drain [pounds the table] with Americans suffering, she said that and got applause, and if anybody thinks that guys like my dad are going to be voting that way when this rolls out of Iowa and New Hampshire and South Carolina, in the early stages, and really gets going, they are out of their mind and they are too stupid not only to prognosticate, they are too stupid to run Slurpee machines in Des Moines. I’ll let you go now. I got it off my chest. Michele Bachmann is a joke. She is a joke. And now I will pass it on to you. Her answer is a joke, her candidacy is a joke, and anybody that sits here and says she has any chance of winning anything is out of their mind. Take your straw poll, take your caucus, but Iowa, if you let her win, you prove your irrelevance once again. Yet, following is a transcript of the actual Ames debate exchange, by Fox News Insider, showing no such welcome of default by Rep. Bachmann. Congresswoman Bachmann, turning to you, you voted against the debt ceiling increase deal and you voted against the Republicans’ “cut, cap and balance” bill. You insisted the country was not at risk of default. If you had your way, the debt ceiling would not have been raised. What do you say to analysts who insist that Americans’ investments, their 401(k)s, their college funds would have been far worse off today? BACHMANN: It — it was very important that we not raise the debt ceiling, because — consider what happened. The Congress gave Barack Obama a blank check for $2.4 trillion. What did the American people get in return? $21 billion in illusory cuts. So from the time I’ve been in Congress, we’ve gone from $8.67 trillion in debt to now almost double, to $16.7 trillion. This is madness. I’ve been all across Iowa. People are almost unanimous: Do not raise the debt ceiling. That was the right thing to do. The worst thing that you can do is continue to borrow money and spend money that we don’t have. BAIER: So, I’m sorry, the — what do you say to the analysts who say that the markets would have fallen through the basement? BACHMANN: I think the — I think the analysts — I think we just heard from Standard & Poor’s. When they dropped — when they dropped our credit rating, what they said is, we don’t have an ability to repay our debt. That’s what the final word was from them. I was proved right in my position: We should not have raised the debt ceiling. And instead, we should have cut government spending, which was not done. And then we needed to get — get our spending priorities in order. Linked is just one of numerous examples, this from her June 26th appearance on CBS’ Face the Nation, of Rep. Bachmann explaining that the big lie of eminent default was and would still be, untrue. Scarborough (and before him, even Bill O’Reilly) seem to be reading from Solidarity USA. NBC was founded in 1926 by the fascistic firm of burgeoning “public-private partnerships,” General Electric, plus RCA and Westinghouse. MSNBC is a collaboration between NBC Universal and Microsoft, whose founder Bill Gates is an ally of George Soros, David Rockefeller, Warren Buffett, Ted Turner, Michael Bloomberg, and Oprah Winfrey and who with them, after a clandestine but leaked meeting, has called for worldwide population control.